We do not provide A&D demo software for electronic downloads because that would not be representive of the real A&D product. 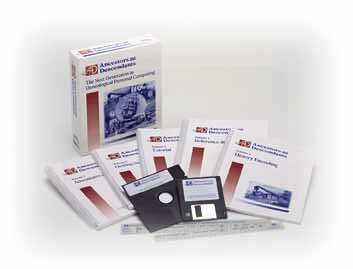 When you buy A&D, you receive personally customized computer programs, the convenience of five illustrated and bound manuals, two keyboard templates, and a large family history to use with our tutorial. This is 3 lb. 6 oz. (1,500 grams) of quality goods you can pick up, carry around, and use to quickly learn A&D. To provide electronic downloads would also put our trade secrets at risk and dilute the resources we apply to A&D product enhancements. If you are cautious, you can request sample reports or buy one or more of our manuals to learn more about A&D. Volume 4, for example, illustrates and explains over 80 of A&D's screens. And when you do purchase our full product, you receive our 30-day money-back guarantee.